Every year on a cold morning in early January, I take off in my Miata and drive the bucolic back roads of Napa County heading northwest toward the humble Sonoma County town of Cloverdale. The drive is a good one as I twist and turn past forests, dormant vineyards, wineries and the occasional farmhouse. Located at the northernmost tip of Sonoma County near the Mendocino border, after about an hour and half I arrived in Cloverdale. Ah, there it was again, the unassuming, but workmanlike Cloverdale Citrus Fair Fairgrounds with its lemon and orange trees bearing winter fruit. This has been the home for the San Francisco Chronicle wine competition for some time. Judging at this large competition is a mighty task and not for the feint of heart. This year’s competition saw 6,417 wines entered from more than 28 states. Everyone at the Chronicle competition including the highly competent staff, the legions of friendly volunteers, the office tech and tabulators, the food prep people and of course, we judges – work very hard. After we’ve all arrived on the morning of the first day, Executive Director Bob Fraser gives a pep talk to the assembled group. He discusses news and introduces any new judges and after a few comments, updates and laughs, we head to a coat rack to select optional lab coats which will hopefully protect our clothes from the spills to come though. (At the end of the competition my lab coat is usually quite a mess) Next, we gather for a group photo and then finally, we head to our respective group locations and get ready to begin sampling. In the Cloverdale Citrus Fair, about 16 stations are cordoned off in a large auditorium, each station with room for either 3 or 5 judges. “The San Francisco Chronicle Wine Competition gives wine consumers a great barometer of the quality and value of current vintages of wines throughout America. The largest wine competition in the United States enables consumers to really learn about wines and the diversity existing between the American Viticulture Regions,” said Bob Fraser, Executive Director, San Francisco Chronicle Wine Competition. Fraser keeps things moving, but with a sense of humor. After exchanging pleasantries with the coordinators and settling in, the first flight of ten wines is poured. The wines are arranges in an arc, with plastic spit buckets, score sheets, pencils and pens, water or sparkling water and food items nearby. Typically we can have fresh bread, plain crackers, olives, some celery and small slivers of roast beef to augment the wine tasting as needed. A little food and palate cleansing is important. My first flight was judging Sauvignon Blancs up to $15.00. There would be 52 for this flight divided into 3 groups of 10 and two of 11. Going left to right, like to pick up each glass and swirl, take look at the color of each glass and take a sniff. It’s a crowed table setting so you have to be careful when picking up glasses. Then I begin tasting, returning to the first wine, taking a small amount of wine in my mouth, swishing it around while breathing through my nose and then spitting it out. What tastes came through: Tropical notes, fruity or grassy? Is it musty? Anything off notes like kerosene? Other noticeable flaws? How was the finish, or was there one at all? Is it unctuous? Lastly do I like this wine and would consumers like it? I always try and image what the “average” person would taste in this wine, at is approximate retail price. Would they like it and be satisfied with the value? Once in a while a wine might be “corked” or seriously flawed in some way, and a judge can ask for a re-pour. When one of the judges says this, we often stop and taste the problem wine to give our opinion. A re-pour is a good thing really, since it gives a wine a second chance, due to some closure problem. In a few minutes, the folks behind the scenes open an alternate bottle waiting in the wings and bring a new glass for the judges to taste. Sadly, most times there is no change at all indicating that the wine was bad, but sometimes it does improve meaning there was some problem with the closure after all. I’ve been on panel where a “corked” wine ended up with a gold medal. Finally, I give each wine a score of Gold, Silver, Bronze or No Medal. Sometime I’m uncertain and pass, to return to that wine later on. After we go through a flight and the panel of judges is ready, the coordinator, standing by a white board, asks us for our scores. One at a time, we might say “I loved it, Gold medal!” or “Silver plus,” or “I give it weak Bronze” or “this was a lousy wine, no medal.” The scores are tabulated and based on consensus, so if three out of 5 judges give a gold medal, that’s the scores, no matter what the other two voted. Yet before the scores are considered official, there’s often discussion or downright debate about a wine. For instance, if I loved a wine but other judges didn’t feel the same, I might ask them to taste again, and reconsider. And maybe sell the others on why this wine should receive a gold medal. Fraser has created a fun and lively Wine Competition and the cajoling, pushing, horse trading and jokes do fly. Ultimately the best wines rise to the top and get the Gold Medals. Sometimes all judges agree right away on Gold and a Double Gold Medal is awarded. This means that every judge on the panel gave a wine a Gold medal. This is a prestigious honor. All of this happens in about fifteen minutes per flight. Then the glasses are whisked away and new flight is arranged in front of every judge. At the very end of a category, we retaste the Gold medal winners and declare a “Best of Class” which will go to the Sweepstakes round. (More on that later) Though wine tasting and evaluating is enjoyable work, it can get exhausting. Wine expert Sue Straight has been a judge at the San Francisco Chronicle Wine Competition for many years. She said, “Wine tasting and judging is unabashedly sensual. That’s why I love it. Some judges, particularly winemakers, tend to focus on the flaws in a wine – they pick a wine apart like a hungry lion picks a carcass clean. I look at the drinkability of a wine. Will other people enjoy it? I revel in the aromas and flavors that the alchemy of nature and science has gifted us with.” Straight is also known in some circles as “The Wine Wench.” The judges take a break for a much needed lunch, make a phone call or two, get some fresh air, check emails and then return to our stations and get back to work. Tastings continue until about 3:45 PM. Judges in this competition taste between 100-125 wines per day in this fashion. Most evenings have a planned group dinner of some kind, such as one at Bob Fraser’s house. (I love his barbecued oysters) Lots and lots of wines are opened and consumed. Much of it is local Sonoma County based but other bottles come from all over the country. 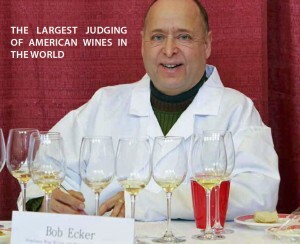 Many of the judges, staff and volunteers work in the industry and bring wines to share. It’s fun to talk wine with fellow pros and sample wines in an easy going way. I learn something new every time. This year’s “gala dinner” was held at the beautiful Francis Ford Coppola Winery in nearby Geyserville. After tasting the new releases, we were treated to a “family style” Italian dinner, hosted by famed Film Director and owner, Francis Ford Coppola himself. After returning to our hotel, some additional partying may take place with more wines, some beer, and a guitar or two. This process is repeated for three days. All in all, this year I judged flights of: Sauvignon Blanc, Syrah, mid-priced Cabernet Sauvignon, Merlot, Bordeaux styled blends, all manner of Rhone Blends (a very good group), Other Red Blends, and mid-priced Pinot Noirs. I sampled over 525 wines including Sweepstakes. On the last day, Friday, the grand Sweepstakes is held pitting all the Best of Class wines per category – against each other. This is a much more serious judging because these wines really are the “best of the best” representing every category in the competition. Also hundreds of people are sitting or standing watching us including media, so we must be on our best behavior. Lastly there are over 100 wine glasses in front of every judge, so you truly need to be vigilant to avoid a catastrophe. Every judge goes through each category, Sparkling, White, Rose, Red and Dessert and must select a first, second and third place per category. The Sparkling, Rose and Desserts classes are easy to judge, with only a few wines to judge, but the Whites and Reds are tough. This year, the Red Category had about 40 glasses to go through, taste, evaluate and prevent for knocking over. When all the judges have voted on every category, the scores are tabulated and shortly Bob Fraser returns to announce the winners. It’s a fun moment for everyone to hear about famous or unknown wines winning the big awards. This year I selected four out of the six winners. All are excellent wines. Shortly after we are given a group photo and a sweatshirt, we say our goodbyes and drift away back to our normal lives. It’s a heady few days and I look forward to doing it again in 2016.